You’ve probably had cucumber, tomato and onion salad at picnics and family dinners. It’s a simple salad that everyone seems to like. I like making this salad by tossing peeled half rounds of cucumber, sliced white onion, and chunks of fresh tomato with red wine vinegar and seasoned rice vinegar, to taste. I use Marukan Seasoned Gourmet Rice Vinegar, which contains salt and sugar in a pleasing combination, but any seasoned rice wine vinegar will do. My lunch often consists of a large chopped salad and some canned sardines that have been rinsed with water and splashed with lemon juice (so no one at work can smell the sardines)! I love chopped fresh veggies, and I often prepare enough for a few days and store it in the refrigerator at work. Especially in the summer – but anytime of the year as well – I enjoy this healthy and low-carbohydrate lunch! For more information on what I put into one of my favorite chopped salads and why I chose these veggies, see the short video/podcast that I did with my sister – who was kind enough to agree to participate without any notice at all. In fact, as soon as I called her on her cell phone to ask if she would work with me on this, she pulled over in her car and we did this video/podcast with her on her cell phone and me on my regular speakerphone. So this video/podcast is totally unrehearsed, and yet I think it came out really well! I’m still amazed! Since we did this podcast, I have come up with another idea I want to share with you. If you do not like sardines that much, you can get used to eating this very healthy fish, gradually. For example, you could bake a mild fish like Dover sole; let it cool; and then mix it in with the sardines. Over time, you can add more sardines and less sole. I made this half-half mixture and added LOTS of chopped fresh dill, and it was great! Note: Wash the avocado before you cut into it! 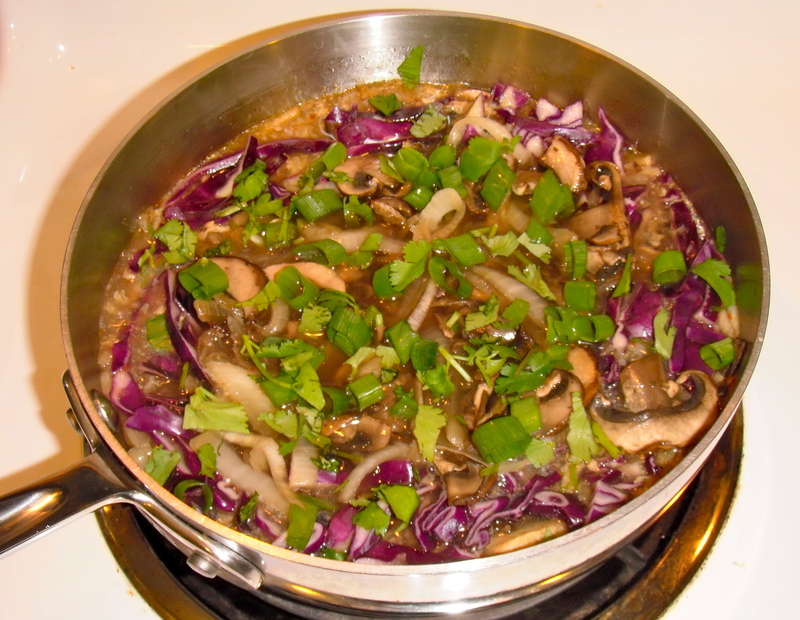 Here’s one of my favorite – easy to make soup meals. It’s so easy you don’t need a recipe! Start with hot and sour soup from a Chinese restaurant that makes good quality soup (not loaded with corn starch and msg). Then at home, add plenty of vegetables plus some tofu — and you have a great, light soup meal! Heat the soup until the cabbage is tender crisp. If you add a lot of veggies and tofu like I do, then the resulting soup will be like a bowl of veggies in a little broth – a nice light meal!